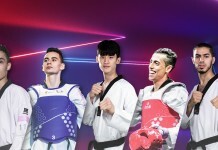 MEXICO CITY, Mexico (December 5, 2015) – The first tranche of 24 taekwondo athletes to put their NOCs through to the 2016 Rio Summer Olympic Games won places after a torrid day of high-octane, high-altitude competition at the 2015 World Taekwondo Grand Prix Final in Mexico City. On the first day of the two-day Grand Prix Final, gold medals were won by China, Great Britain, France and Korea. In addition to their gold medals, winning fighters each took home US$6000 in prize money and a local gift: A Mexican sombrero. The fitness of the fighters was tested to the limit by the city’s altitude, but when the smoke cleared at the city’s Sala de Armas – the Olympic fencing venue in the Magdalena Mixihuca Sports Complex – the top-six ranked taekwondo fighters in four Olympic weight categories owned berths to Rio. Eight fighters had competed in each of the categories. Another 24 athletes in the four remaining Olympic weight categories will win their NOCs berths to Rio on the Grand Prix Finals’ second and final day on December 6. Further Olympic berths are available through next year’s Continental Qualification tourneys. In the female -49kg category, China’s Jingyu Wu faced off against France’s Yasmina Aziez for the gold. 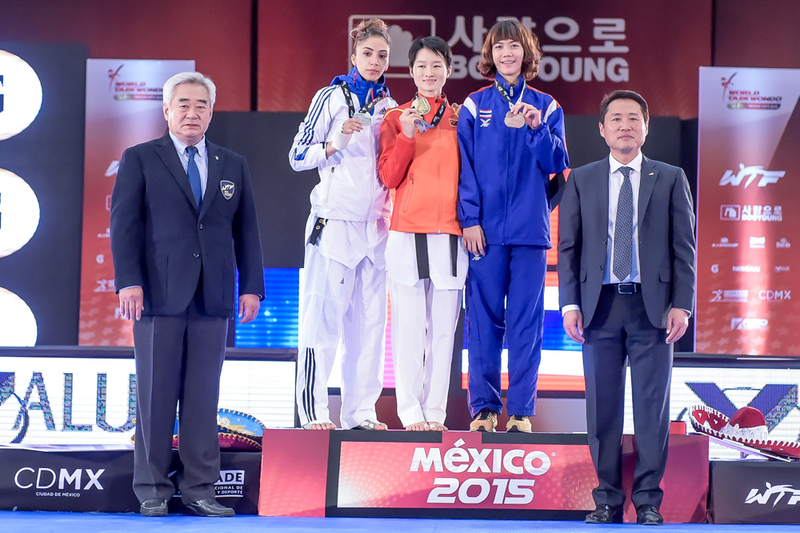 The French girl had the height advantage, but Wu is possibly the most dominant female fighter in taekwondo. Aziez seized the first point before Wu equalized in a flurry then scored another to end the first round 2-1. In the third, Wu, fighting with perfect composure landed a punch, raising her score to 5-1, then 6-1. Aziez came back in the dying seconds, taking the board to 4-6, for Wu. Thailand’s Panipak Wongpattanakit beat Mexico’s Itzel Manjarrez 3-2 for the bronze. In the category, after rankings were computed, China’s Jingyu Wu, Croatia’s Lucija Zaninovic, France’s Yasmina Aziez, Thailand’s Panipak Wongpattanakit, Brazil’s Iris Tang Sing and Korea’s So-hui Kim won quotas for Rio. There was everything to fight for in the male -80kg category, as the world’s number one, Mahdi Khodabakhshi, was sidelined with an ankle injury sustained at the Manchester Grand Prix Series 3, leaving Moldova’s Aaron Cook to fight Great Britain’s Lutalo Muhammad for gold. It was a match with historic ramifications, for British Olympic selectors’ decision to choose Muhammad over Cook for the London 2012 Games prompted Cook to depart Team GB. Cook, the crowd favorite, got down to business landing a body kick against the much taller Muhammad for a point but Muhammad scored back with a classic Cook-style technique – a jump spinning round kick – for 3 points. In the second, the Briton slowed his pace. Cook attacked and attacked, but could not penetrate Muhammad’s tight, back-weighted defense. Cook fell, then lost another point as Muhammad’s stabbing side kick slammed into his midsection. The second ended 5-1 to Muhammad. In the third, Cook won another point but visited the mat again. Cook attacked, but Muhammad jammed Cook’s spins, denying him a high-scoring kick. With Cook tumbling yet again, the match ended 7-3. Muhammad looked delighted; Cook fell to his knees in tears. Iran’s Masoud Hajizavareh beat Russia’s Albert Gaun to take the bronze, 5-4 – then succumbed to exhaustion and fell to the floor. In the category, Iran’s Mahdi Khodabakhshi, Moldova’s Aaron Cook, Great Britain’s Lutalo Muhammad, Russia’s Albert Gaun, Germany’s Tahir Guelec, and Cote d’Ivoire’s Cheick Sallah Cisse won their NOCs Olympic slots. In the female -67kg category final, France’s Haby Niare took on Turkey’s Nur Tatar. Niare was already through to Rio on ranking points, but fought in Mexico for the sheer joy of the sport. Despite some fierce flurries, the kicks were not registering, and the first round ended 0-0. So did the second. The French girl had been looking more relaxed, powerful and active and finally won a single point. In the last 10 seconds Tatar launched an all-out assault, but Niare held her at bay, winning the gold, 1-0. Sporting a huge grin, she danced across the mat in a spontaneous exhibition of delight. China’s Hua Zhang beat Russia’s Anastasiia Baryshnikova 4-1 for bronze. In the category, France’s Haby Niare, Sweden’s Elin Johansson, Chinese Taipei’s Chia Chia Chuang, Korea’s Hye-ri Oh, Russia’s Anastasiia Baryshnikova and Turkey’s Nur Tatar won berths to Rio for their NOCs. In the male -58kg category, Iran’s Farzan Ashourzadeh Fallah battled Korea’s Tae-hun Kim. The match started with cagey front foot-fencing, as both boys tried to find the range, but with the Iranian looking lighter and faster. The round ended without a score. In the second, Kim tried to drop the ax, while the Iranian returned fire with tactical cutting kicks. Again, the round ended score-free. Ashourzadeh Fallah finally took a one-point lead after Kim earned his second penalty – then, in the last three seconds, Kim connected with a round kick to the head for three points and the gold. Mexico’s Cesar Rodriguez beat Portugal’s Rui Braganca on superiority in golden point for the bronze in a fiercely contested match, delighting the vocal home crowd. In the category, Korea’s Tae-hun Kim, Iran’s Farzan Ashourzadeh Fallah, Portugal’s Rui Braganca, Germany’s Levent Tuncat, Mexico’s Cesar Rodriguez and Belgium’s Si Mohammed Ketbi won Olympic places for their NOCs.